The Tucson Convention Center is the largest multiple venue facility in southern Arizona. TCC opened in 1971. That’s is a long time ago folks. When it opened, TCC provided over 200,000 square feet of meeting and exhibition space combined with a 500+ seat theater, 2200+ music hall and 8900 seat arena. 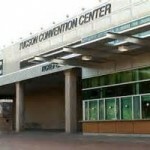 For the historians, the Tucson Convention Center was originally identified as the Tucson Community Center. TCC has been home to many Tucson events during the over 40 years since it opened. Perhaps the biggest is the annual Tucson Gem and Mineral Show based at TCC. Unfortunately, after 40+ years, the facility became outdated and run down. Now, after years of planning, new life is coming to the Tucson Convention Center. The TCC is a focal point of the Rio Nuevo District. Rio Nuevo began remodeling TCC in March 2014. The $8.8 million project will renovate seating, concession stands, sound system, lighting and video display. Funding was provided by Rio Nuevo and the City of Tucson. In conjunction with the renovation, the City of Tucson has entered into a management agreement with SMG on October 1, 2014. They will manage operations of the Tucson Convention Center, Tucson Arena, Tucson Music Hall and Tucson Leo Rich Theater. SMG will management the facilities of the Tucson Convention Center as well as use their network of clients, booking services and resources to improve the economic performance of SMG is a recognized municipal facilities management company with over 230 facilities under management worldwide. .
TCC Music Hall: seats 2,289 seats- used for concert performances, including opera. Leo Rich Theater: 511 seats- for small scale and more intimate performances. TCC Arena: 4,988 permanent seats, 2,724 bleacher seats, and floor capacity for 888. Those attending the upcoming (October 11, 2014) performance of Disney on Ice this weekend at the Tucson Convention Center will be the first public group to experience the transformation. Members of Tucson’s media previewed the renovated Tucson Convention Center area on Thursday, October 9, 2014. While almost completed, there is another 20% to be done to finish the arena renovations. The rest of the project is scheduled to be completed by the end of 2014. The additional work will provide a new entrance and east side ticket office signage. A grand opening event is slated for January 2015. The downtown areas in the City of Tucson are continuing to be revitalized. The recent opening of the new streetcar system provides better access to downtown restaurants, shops and University of Arizona.The Tucson Convention Center project will add to the many reasons for residents and visitors to “come on down” to downtown Tucson. Considering a move to Tucson Arizona OR looking for a future place to call home? We can help!